One of the things that most people like about soccer is that it is a team sport. At any level of competition the pitch is to be shared among teammates who all want to benefit their team in order to win. There might be a star among its players but he/she won’t be able to beat the other team when he/she is facing the entire opposition on their own. At the highest level of competition like the “FIFA World Cup”, it is no different. Many of the teams that have hoisted the trophy do it because they play as what they are supposed to play, as a team. Let’s backtrack to the last three World Cups. France had in Zinedine Zidane all its hopes. He was already destined to be called among the best players to ever play the game (my personal favorite) but when facing a squad like Italy in the final of Germany 2006, Zizou’s magic was not enough to be victorious. With Buffon under the three posts, Cannavaro, Zambrotta and Materazzi leading on defense. Mauro Camoranesi, Pirlo and Gattuso taking control of midfield and Del Piero and Totti closer to the opposing net, they were as good as they needed to be to win it all. 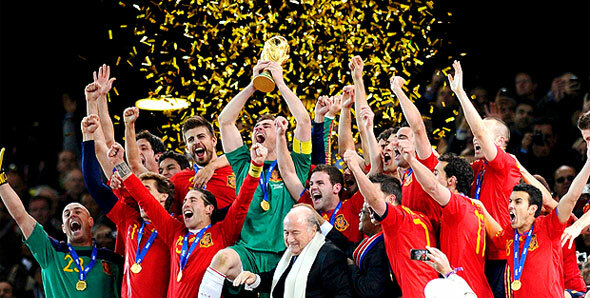 Four years later Spain also played as a team and conquered the world with players like Casillas, Ramos, Puyol, Iniesta, Villa and many others under the guidance of Vicente del Bosque. They were not a team known for their high scoring but for their way to treat the ball keeping it away from rivals and giving the audience something nice to see. Brazil, for many years played that way but after 2002 when the won in Korea-Japan, they forgot all about it and depended on guys like Ronaldinho to produce the whole show. That did not work. This time they have a more balanced team, where Neymar is the star but can count on every one of its players to do a good game from the goalie to the strikers. Same is the case for Germany, one of the teams that is always expected to perform as well as its cars during soccer competitions. A team know by its discipline and how fearless they going after every ball. They were second in Korea-Japan and third place in South Africa, they consider that failure since they expect perfection and that is translated into being called champions. This time, they are not messing around anymore, anyone should consider Germany a serious contender for the Jules-Rimet trophy. Recently a german coach took control of the U.S.A. national team. After Bob Bradley’s era came to an end, Klinsmann who had already coached his nation at their home World Cup in 2006 where they finished third, now took over a team that has been tuning up to be the best in north america (even better than Mexico). He had three years to work his magic over a team where he had not coached at club level. Whatever he did worked as the US qualified first in CONCACAF and their final victory over Panama helped Mexico fight for a Wild Card spot. Right before the World Cup, he announced that Landon Donovan, considered by many the best player in the nation did not make the final list. He was booed by many that believed it takes a player with over 100 games playing for the stars and stripes with close to 40 goals. What most people did not know, is that the 23 invited to Brazil are just as good as a team as it can be. They play with the determination that the “Kaiser” has instructed them to play with and the discipline germans play. They do not fear any team no matter how good they are, the will to succeed from this team can’t be doubted. Today they beat Ghana 2-1 without Donovan on their opener of “The Death Group”. Portugal has Cristiano Ronaldo, Argentina has Lionel Messi, but none of them can think of winning the whole thing by himself, he needs the other 10 players on the pitch or he will be sent home early. In the end, that’s what makes a team sport a TEAM. There is no “I” in team.